Megapixel counts continue to climb, but some of the biggest new camera features could only be possible with a single megapixel — like photographing objects that you can’t actually see. A research group from Xi’an Jiaotong University in China led by Bin Bai recently designed a 1-megapixel camera that can photograph objects the human eye can’t even see from the same angle. The single-megapixel shooter can photograph objects that aren’t in it’s direct line of sight, like what’s around the corner. Like traditional cameras, the new experimental shooter records light, but unlike most, the camera can capture reflected light and make out an object that’s around the corner. The camera doesn’t need a direct line of sight to the object, as long as it is facing light that is bouncing off that object. Light naturally bounces off objects — that’s what makes it possible for a photographer to bounce a flash off a wall for a less intense light or why taking a photo of something next to a bright green wall will give that object a green hue. The process of taking the actual photo starts with randomizing the light that hits the camera and recording the intensity. Do that 50,000 times and software algorithms can not only put all those randomized pieces together, but from all those individual photos construct an image of the object based on only that reflected light. While the camera will have limitations, resolution isn’t one of them. Since the camera reads the image 50,000 times, when all that data is combined, the result is a high-resolution file, despite the sensor’s 1-megapixel resolution. One of the limitations is likely going to come from those 50,000 photos — while the research team didn’t say how long it took to take that many photos with the camera, requiring that many exposures likely means the camera won’t be able to photograph moving objects. 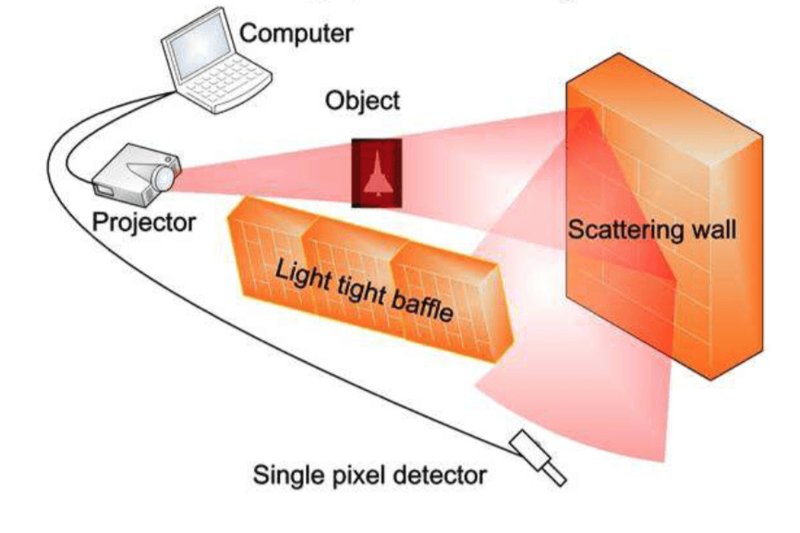 The research group isn’t the first to attempt to build a camera that can see around corners — a group from the Massachusetts Institute of Technology received funding from the United States Department of Defense for a camera that sends out a laser that bounces off those objects. Based on the varying times when that laser comes back to the camera, a computer algorithm can develop a digital reconstruction using distances calculated all from that laser’s reflection. The single-megapixel camera with similar capabilities is one in a growing list of products using a small, single-megapixel sensor to do things other cameras cannot — like a camera without a lens and a camera that measures only 2mm deep.